Injecting wastewater deep underground as a byproduct of oil and gas extraction techniques that include fracking causes man-made earthquakes, the lead author of new research from Arizona State University said Thursday. “It’s a hot topic” because “injection and fracking is extremely important in terms of jobs, money and independence,” Shirzaei, an assistant professor in the School of Earth and Space Exploration, said. The technique to extract oil and gas from rock using a high-pressure mix of water, sand or gravel and chemicals produces lots of wastewater, he said. This wastewater is disposed of through underground injections that “have led to an increase in earthquakes across the United States,” he said. “So now the goal, the scope of every scientist across the U.S.A., and maybe abroad, is to make that injection safer” by “reducing the number of earthquakes as much as we can,” he said, explaining why the research was done. Shirzaei was careful to say that the injection of wastewater can come from processes associated with oil and gas extraction other than hydraulic fracturing. He said the study, published in the journal Science, shows that researchers can estimate how much pressure is increasing underground, providing a chance for wastewater injections to be halted before the buildup reaches a critical stage. The pressure, he said, eventually returns to normal, allowing the injections to resume. Shirzaei said he already has plans to present the findings to state and industry leaders in Texas and Colorado. He said that no one from the oil and gas industry has seen the work because researchers wanted to maintain their independence. The research could help reduce quakes like those felt recently in east Texas, which hasn’t experienced such seismic activity historically. In May 2012, a 4.8 magnitude quake hit Timpson — the largest ever monitored in the region. Several more temblors hit the area over the next 16 months. The quakes marked a significant increase in east Texas and in areas of the U.S. where unprecedented volumes of wastewater are being shot into deep geological formations. About 2 billion gallons of wastewater get injected underground every day into about 180,000 disposal wells in the U.S., mainly in Texas, California, Oklahoma and Kansas, according to the official news release. For the study, Shirzaei and co-authors William Ellsworth of Stanford University, Kristy Tiampo of the University of Colorado Boulder, Pablo González of the University of Liverpool (UK), and Michael Manga of UC Berkeley focused on four high-volume wells used for disposing wastewater near the epicenter for the Timpson, Texas, earthquake, the release said. ALOS L-band satellite. Courtesy of Japan Aerospace Exploration Agency. The researchers used space-borne Interferometric Synthetic Aperture Radar (InSAR), a remote satellite-based sensing technique, to measure the surface uplift of the area near the wells, the release said. The researchers then calculated the strain and pore pressure underneath the wells that resulted in the uplift and, in turn, triggered the earthquakes, the release said. The research found that seismic activity increased, even when water injection rates declined, due to pore pressure continuing to diffuse throughout the area from earlier injections, the release said. Satellites measuring surface uplift near the injection wells. Colored circles show pore pressure increase at the location of the earthquake. Injection wells are shown in red with injection depth indicated in blue bars. InSAR uses a highly accurate radar to measure the change in distance between the satellite and ground surface, allowing the team to show that injecting water into the wells at high pressure caused ground uplift near the shallower wells, the release said. In addition, the data show less seismic activity in denser rock where pore pressure was prevented from disseminating into basement rock, helping to explain why injection can, but does not always, cause earthquakes, the release said. By integrating seismic data, injected water histories, and geological and hydrogeological information with surface deformation observations, the researchers have provided a definitive link between wastewater injection and earthquake activity in Texas, helping explain why injection causes earthquakes in some places and not others, the release said. “This research opens new possibilities for the operation of wastewater disposal wells in ways that could reduce earthquake hazards,” Shirzaei said, in the release. 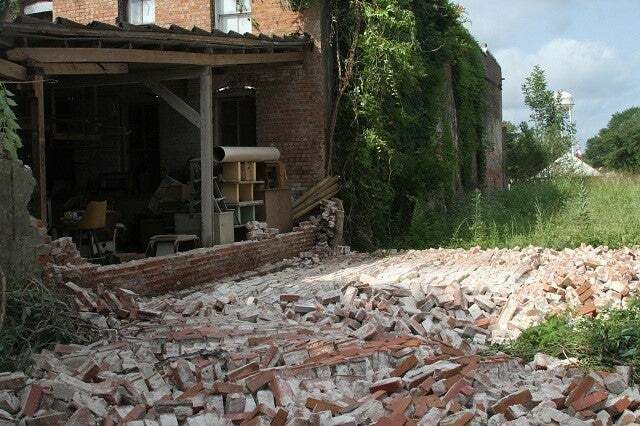 Top photo: Damage from Timpson, Texas earthquake on May 17, 2012. Courtesy of Timpson and Tenaha News.